Over the past 2 days I have noticed she was a little flatter than normal, and over the preceding 5 days she wasn’t her normal zippy self. Her water consumption has also been up over the last 3 days or so. I had also been monitoring her movement for the past 5 days or so – she seemed more gingerly, and with her turning 8yo this month arthritic or joint pain is something that I am constantly on the lookout for. This morning on the way out for our first training session of the day she vomited in the back of the van – just fluid – but still, it was on my radar. She wasn’t her normal self, so I resolved to observe her more closely. When we returned to the office to resume the work day she was very flat and had a change in affect, and so I put her in the couch in the office. When I returned she was chilling on the carpet in the middle of the room and had vomited in the same way as earlier in the morning, though this time on the leather couch. Quickly cleaning that up, I took her out to see what her hunger level was like – often a good indicator of illness in dogs – and she had zero interest despite the typically appetising food in front of her. I checked her gums for colour, and they were very light. When I pressed on them there was a return on blood flow to the tissue, but it still seemed off. Often one behaviour on it’s own seems insignificant until you put it in context, and then start to see it alongside many pieces of the puzzle – it’s the same with individual symptoms of sickness. So I called my dear friend and Veterinarian, Dr Kim. I gave her the run-down above and she suggested I take her off to a local vet ASAP. 15 minutes later the office was locked up and we were in the van and on the phone to let them know we were on the way. An ultrasound showed pyometrea – it’s a condition that I’ll likely do another post on down the track. It affects the womb (Kana is/was entire). 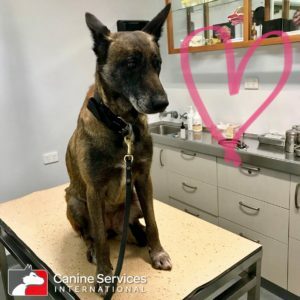 The first vet we went to had a severe and high-care trauma case in that day, so rather than leave her there overnight and unobserved I took her to another local vet where I have a relationship with the surgeon that would be operating on her, same day. Barring any complications this surgery is expected to be very straight forward and I’m expecting to pick her up tomorrow morning. I’ll likely do another post about this along the way.